At the United Nations a letter from Queen Sylvia of the Netherlands is read detailing how shocked she is at the flagrant disregard for human rights and the borders of nation by former Ambassador Van Derkli. A proposal is made to allow the United States to dispatch the Justice League of America to Santa Bertiza and Del Canto at the earliest possible opportunity. Meanwhile the Justice League is already in those countries and in short order rescues the families of those who were forced to become metahuman soldiers. In addition to that mission they take Victor Blasco and Paco De La Fuente into custody. After regrouping momentarily the League witnesses Cristoffels' super-soldiers killing the remaining metahumans in both countries. When a group of those soldiers attack they reveal themselves and defeat the soldiers and the monster Cristoffels sent to destroy anything that got in its way. Batman and Aquaman confront Cristoffels and place the madman under arrest. They also take possession of the rare metal, much to the chagrin of President Horn. Some time later the World Court in Hague sentences Cristoffels, Van Derkli, Blasco and De La Fuente to life imprisonment. With the financial assistance of Bruce Wayne the Justice League builds a hospital on the grounds of the contested land between Santa Bertriza and Del Canto. Though a formal dedication was planned the State Department arranged for a private ceremony for the surviving metas and their families. Story - 4: This was a solid wrap-up to "Secret History, Sacred Trust". Actually it was a bit surprising how neatly all of the story elements were tied together. This had a happy ending where the good guys triumphed and the bad guys were punished. Some readers may have been surprised considering Howard Chaykin is the writer and he has something of a reputation for doing work that is at best controversial and at worst something I can't mention in a family review. The thing is it shouldn't surprise anyone because even though he is the creator of AMERICAN FLAGG he also strikes me as an old school comic book fan that writes super-hero stories because he thinks it might be fun. Like a good deal of his recent work this story was an old fashioned, super-hero romp and from beginning to end it was about a group of heroes doing their best to keep the world safe even if they have to hide their true identities to do it. I mean what is more quintessentially super-heroic than to adopt another identity to fight injustice? There were some confusing moments. How the heck can Wonder Woman, the Flash, the Martian Manhunter, Green Lantern and Superman actually sit there and talk about mass murder on the part of Cristoffels' soldiers and say, "There's nothing we can do about this."? I realize that it made the next scene of the Justice League casting their disguises aside and going into action all the more exciting, but the rational, overly analytical part of me kicked in and threw a flag on the play. Also, as tightly as everything was wrapped up it was a little too easy. For five issues there was heightening drama with a good deal of twists and turns only to have it all taken care of in the last chapter with a bow on top for good measure. Again it wasn't bothersome enough to make me dislike this issue but it was enough for me to mention it here. Then again the scenes with Batman and Aquaman more than made up for any minor problems I may have had. Still and all this was the first CLASSIFIED arc I've enjoyed from beginning to end in quite some time, so my hat (if I had one) is off to Howard Chaykin. Thanks for the great ride. Art - 4: The artwork was consistently good for six issues. I'm going to write that again. The art was consistently good for six issues. This is something to be proud of. Plunkett and Nguyen's combined style may have been a little rough but it was also powerful and gave the story the harsh edge it needed. Plunkett has such a strong story sense and his layouts really captured the emotion the story was going for at the moment, whether it was the sad state of affairs in Del Canto or, like in this issue, the Justice League bursting out of their disguises to take on Cristoffels' army. Even the backgrounds were impressive and I loved the level of detail they put into their artwork. While the covers had some problems the interior art was one of my favorite aspects of this story. Cover Art - 2: As much as I liked the art on this inside of the book I disliked the cover. It did absolutely nothing for me. Technically the art was good, but I just didn't think much of it. 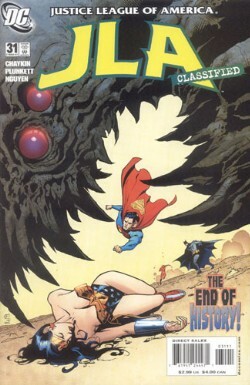 Wonder Woman lying on the ground with a monster hovering above her while Superman, Batman and the Flash look on seemed out of place with the rest of the story. Then again I might be a tad picky when it comes to covers. Such things are possible. Be that as it may I stand by my rating.